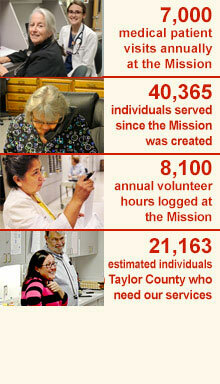 "Joseph was unaware of the services of the Mission and was very grateful to hear the words, "We can help!" He is pictured with Jennifer Eames, PA, a volunteer medical clinic provider. Affordable medical care is available to patients in part from a gracious grant from the Community Foundation of Abilene. • Between ages 18 and 64. • No healthcare insurance (including Medicare and Medicaid). • Annual income must be at 200% or below, of the Federal Poverty Guidelines. • Must provide proof of income (tax return, pay stub, etc.). To view the most current federal poverty guidelines and our per visit pricing, please click the link below. If you are interested in becoming a patient, please print, complete, and return the information packet below to the Medical Clinic. Copyright © Presbyterian Medical Care Mission | Designed & Hosted by iThink Marketing.